Our school is proud to partner with the American Heart Association again this year! In the past, we participated in Jump Rope For Heart and this year we’re kicking off the Kids Heart Challenge! Your child has received his/her fundraising envelope. Start by setting up a personal fundraising page at www.heart.org/kidsheartchallenge or download the Kids Heart Challenge mobile app—check out the envelope for easy instructions. DON’T FORGET TO TAKE THE HEALTH CHALLENGE! Our school is proud to partner with the American Heart Association again this year! In the past, we participated in Jump Rope For Heart and this year we’re kicking off the Kids Heart Challenge! We’re excited to continue jumping rope to help those with special hearts! Did you know that heart disease is the No. 1 killer of all Americans, 80% of it may be preventable through lifestyle changes? The Kids Heart Challenge program and its educational resources will teach your child the importance of developing heart-healthy habits which can serve a foundation for the rest of his/her life. In addition, students will participate in cardio-challenges, pledge to improve their own health and build their character, all while raising live-saving funds to help save and improve lives. There is even a parent corner with tips on keeping your children healthy at home! You child will also feel good about participating in a community service project that will help the American Heart Association fund research, advocacy and education initiatives that save lives in our community. In addition, our school can earn money for PE equipment and your child earns fun thank you gifts that encourage him/her to keep up the good work for heart health. And that’s something to jump up and down about! Your child has received his/her fundraising envelope. 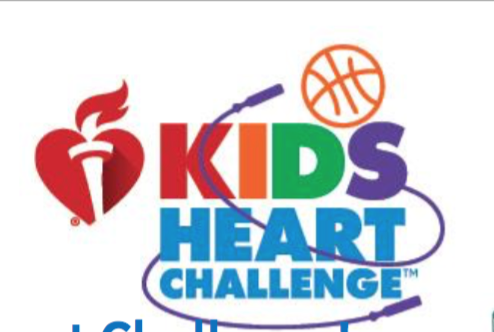 Start by setting up a personal fundraising page at www.heart.org/kidsheartchallenge or download the Kids Heart Challenge mobile app—check out the envelope for easy instructions. DON’T FORGET TO TAKE THE HEALTH CHALLENGE! Askfamilyandfriendsifthey’dliketodonate.Notsurewhattosay?Yourchild can use the simple script on the collection envelope. Encourage your child to get active and have fun at his or her school event! I hope you are as excited as I am to support our students in this important experience.